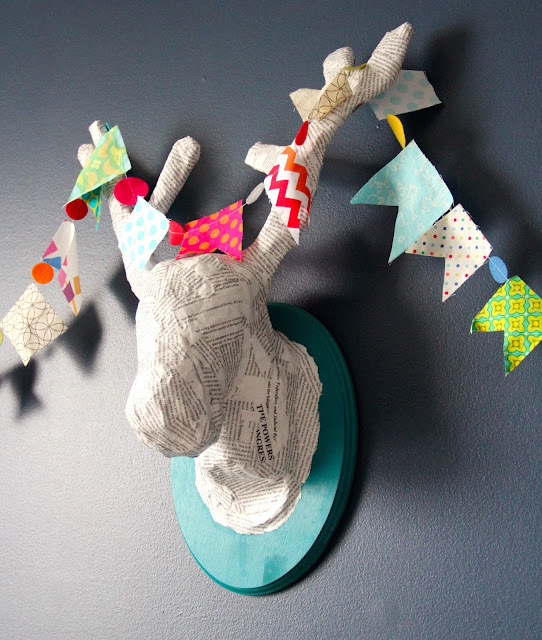 Faux taxidermy and mini scrap bunting that is. I made the bunting at Craft Weekend. We used felt from BenzieDesign. It only took me 9 months to hang it up! I used Lil Blue Boo's tutorial for the paper mache faux taxidermy head. These two projects are hanging in Nick's room. I didn't have to put too much effort or money into the deer head which I'm happy about since I know as soon as he forms an opinion about how he wants his room, it will likely be gone. Either that or this trend will have run its course.